Nam Nguyen will tell you it has been anything but a smooth ride since those heady days in 2015, when he broke through as Canadian champion at age16. It seemed then that he would be the rising star in men’s skating in his country. But, following that, a pair of growth spurts provided endless frustration and little success. 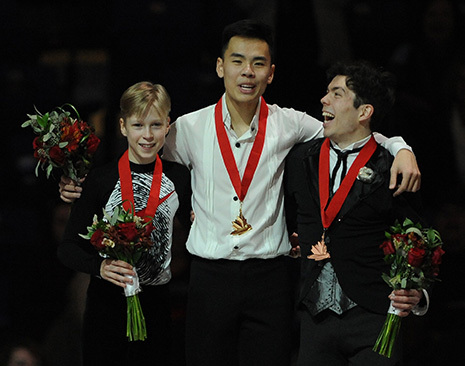 Saturday night provided a moment of sweet redemption for Nguyen, 20, who rose to the top step of the men’s podium at the Canadian Championships in Saint John, New Brunswick. Canada can send two men to the World Championships in March, and with Gogolev not being age eligible, Nguyen and Messing got the nod. Gogolev is headed to the World Junior Championships. Maybe there is something about the salty Maritime air that inspires Alaine Chartrand who found herself back where she was three years ago in Halifax — on top of the senior ladies’ podium. Chartrand trailed short program winner Gabrielle Daleman by nearly 11 points heading into the free, but the 22-year-old Chartrand laid down her best free program at nationals since that golden day in 2016, which gave her a second Canadian title with 185.91, and a 16.32-point lead over the rest of the field. Aurora Cotop, last year’s fifth-place finisher, captured her first senior medal with 169.35. At age 16, she is the youngest senior ladies’ medalist since Daleman won silver in 2014 in Ottawa at the same age. Daleman, the defending champion, had two falls and a pair of near-falls in the free. She placed eighth in the segment and tumbled all the way to fifth in the final standings. Canada has three ladies’ spots for the Worlds in Saitama, but after Chartrand, it is anybody’s guess as to who Skate Canada will assign to the other positions. It was not the runaway victory many might have expected, but Kirsten Moore-Towers and Michael Marinaro captured their first Canadian pairs title with 202.75 points overall. In the senior debut at nationals a year ago, Evelyn Walsh and Trennt Michaud claimed silver with 189.87 points. “It’s a super special feeling,” said Michaud, 22. “It’s crazy. For Camille Ruest and Andrew Wolfe, it was a rough free skate but they did enough to grab the bronze medal with a 166.84 total. “I guess you could say we’re still learning,” said Wolfe, 23. “This is a new type of competition for us, being in this position. We took some steps at this competition that we’ll use for the future. Piper Gilles and Paul Poirier were convinced the night was theirs. And in the eyes of the judges — and perhaps the audience — it surely was. But, by a razor thin margin, it was not enough to prevent Kaitlyn Weaver and Andrew Poje from claiming their third Canadian ice dance title with a combined total of 213.78 – a mere 1.47 points over Gilles and Poirier (212.31). “We just wanted to go out there and skate for us, for our hearts and for the people who have been there for us along the way,” said Poje, 31. Gilles and Poirier cast a spell over the audience at Harbour Station and both felt they had done enough to win this competition, but it was not to be. “We did win the free and we did post a new Canadian (high) score,” said Gilles, 27. “That’s the special thing about this program — every time we perform it and show it to people, it creates a lasting memory for them,” said Poirier, 27. Laurence Fournier Beaudry and Nikolaj Sørensen, who previously represented Denmark, danced into third. “We never thought that moment (winning a medal) would happen, so it’s very exciting and at the same time it’s very motivating,” said Fournier Beaudry, 26.